I did some research on the internet to try to find the ‘must try’ spots in Vegas. I searched, best cocktails, trendiest, Tiki, retro and newest on the strip and I came up with some beauties. The search for the perfect Sapphire & Tonic was on. 1st we hit the lounges and bars closet to the Wynn(where we were staying). Most notable had to be the Surrender Nightclub at the Encore(next to the Wynn). The cocktail was fantastic but I’m not sure if that was the taste or the overall visual experience of the club and patrons. Ah youth. Another favorite spot or me was the Parasol Up Lounge at the Wynn. This was a spot that I would end up at the end of the evening while my buddies were hitting the tables. A nice S&T that I would combine with a robusto cigar while I would observe the coming and goings on the gambling floor. 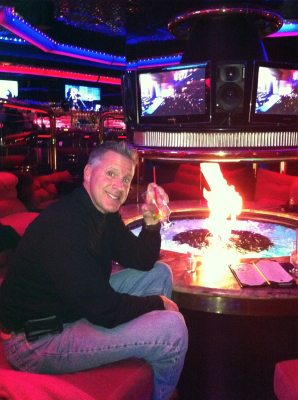 Not far from the Wynn was a real gem called the Peppermill Fireside Lounge. If you appreciate the Retro Cocktail history that Vegas has produced with the likes of Frank, Dean & Sammy, you will really get a kick out of this throw back to the 50’s & 60’s that the Peppermill provides. Combine the famous fire pit in the middle of the lounge with the waitresses dressed in evening gowns, the neon lights and the mirrors and you get a real Austin Powers experience.